What gear do I use? One of the most popular questions… The basic philosophy is for your gear function effectively and be as light as possible. Wing – I’ve been flying an Ozone LM5. 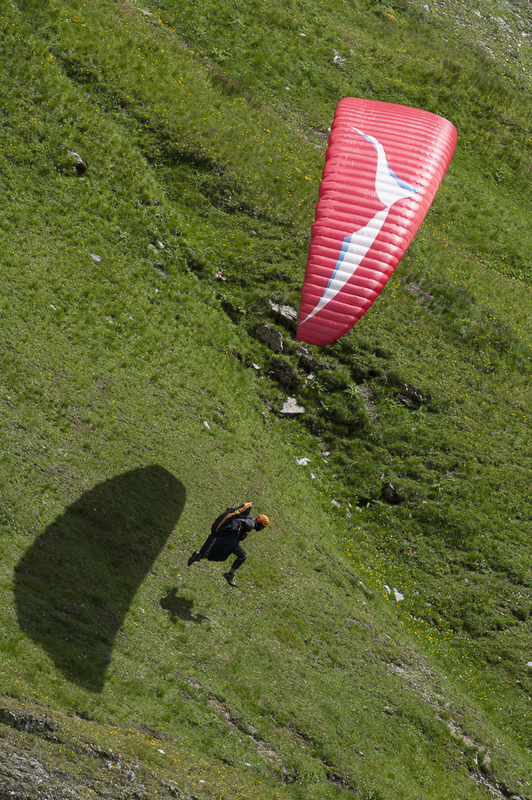 This is the lightweight EN-D (DHV2/3 serial class) glider released for the 2013 X-Alps. I bought it because it is designed for exactly for the type of flying I’m interested in – exploring mountains in a wide range of meteorological conditions. Handling is important and you need to be able to easily launch and land anywhere. For me the performance of my wing is a key factor in making me feel safe in the air – I’m more concerned about whether I can make that glide or push into that headwind than whether I can deal with the turbulence – because I am comfortable on my wing. Because the wing is light it is a joy to launch. My biggest fear is damaging the wing, so I minimize moving the wing over the ground to avoid abrasion. Despite my strong recommendation to do lots of ground handling, with this wing I save it for flying only. My previous mountain wing was a Gradient Montana. This is an EN-B (DHV1/2 fun class), designed to be light. As I wanted to be comfortable on a safer wing and I knew I’d spend a lot of time carrying it on my back around the mountains, saving a few extra kg was definitely worth it. My first ever wing was a Gin Bolero Plus (EN-A / DHV1, beginner class). Now it feels heavy but really it’s only a few extra kg. It was great to know that whatever air I found myself in, the Bolero would take care of me, and unless you’re doing long crossings or pushing headwind, the performance often doesn’t make that much difference. Since I was flying on my own in unfamiliar places so often it took me two years to finally get around to replacing it. I have also flown the Nova Ra and the Gradient Aspen3 in Australia, and these wings have taken a beating with lots and lots of ground handling (kiting). It is essential to be totally comfortable with your wing on launch and it can save a lot of time if you have the skills to pull off a good launch in challenging conditions or from a tight spot. Go and practice! Harness – I will be flying the Ozone Ozium light for the 2015 X-Alps. I need my pod harness to be lightweight. Comfort and the performance and warmth of a pod are other key considerations. It’s great that the X-Alps has spurred the development of lightweight equipment and I have benefited from this particularly with my Advance Lightness harness, which was very well made and only recently suffered damage when I hastily forgot about the speed bar pulley. This replaced my Supair Altirando XP harness which served its purpose well but is now in tatters – lightweight gear is good but somewhat a consumable item! Mostly it was worn from using it as a backpack, sun and abrasion are very noticeable when you put it side by side with a newer version. 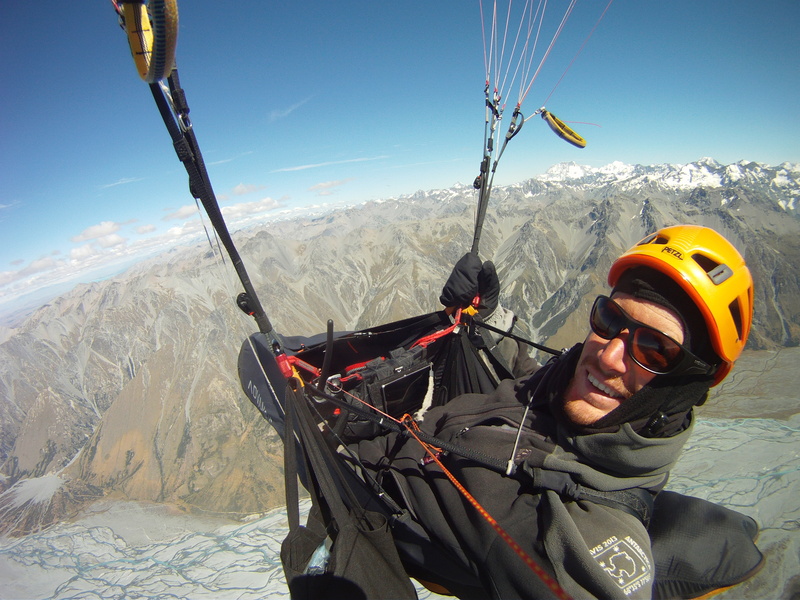 But it was a definite improvement from the early days when I was flying around in my half kilo Supair Everest harness whilst wearing a hiking backpack. Another consideration for the harness is having space to take your vol biv gear while flying. I can usually squeeze it in but for longer trips with extra food I have even hung a reusable shopping bag off the carabiner. It’s always good to improvise. Backpack – for the X-Alps, I want it to be as light and as small as possible. For vol biv, I often use the same backpack but have heavier items (particularly food and electronics) on a small light pack hanging on my front. When I start being able to fit everything into my backpack I know I’m running out of food! I often use a bigger more durable backpack (Gradient makes a good one) for longer trips or travelling. Reserve – I don’t ever plan to use it! Some people I know fly without it, and that’s fair enough considering the risk of not being able to steer when over some of the terrain we are flying across. But on the other hand it’s handy to have the option. I fly with the lightest available certified reserve. Helmet – Also something that I don’t plan to need, but worth having. I want the lightest possible protection, you can’t get much better than the Petzl Meteor 3+ (235 grams), but since being certified for cycling, rafting, and mountaineering (EN12492, EN1078, EN1385) isn’t enough for the X-Alps I’ve gratefully accepted the lightest (390 gram) EN966 model from Icaro, the Transalp. 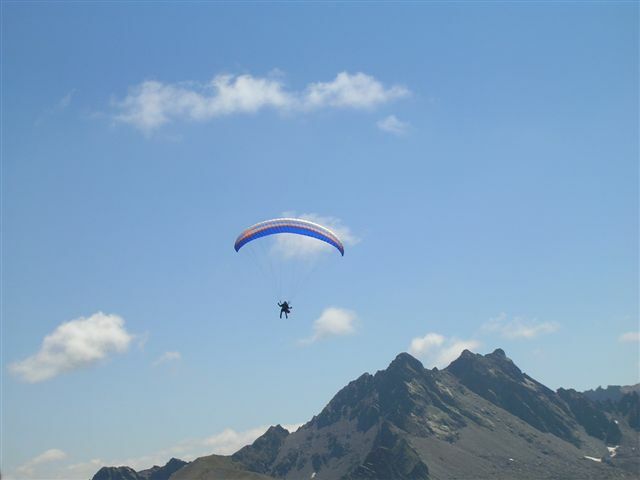 Insurance – regrettably many insurance companies exclude paragliding, even more exclude competition. It depends on your country but in New Zealand try Covermore, and for competitions try Globalunderwriters. Boots – if you do the miles, these wear out. I’ve been using heavy duty semi rigid boots, like the La Sportiva Makalus and the Asolo granites, which tend to last a bit longer. But it depends on what you are doing. 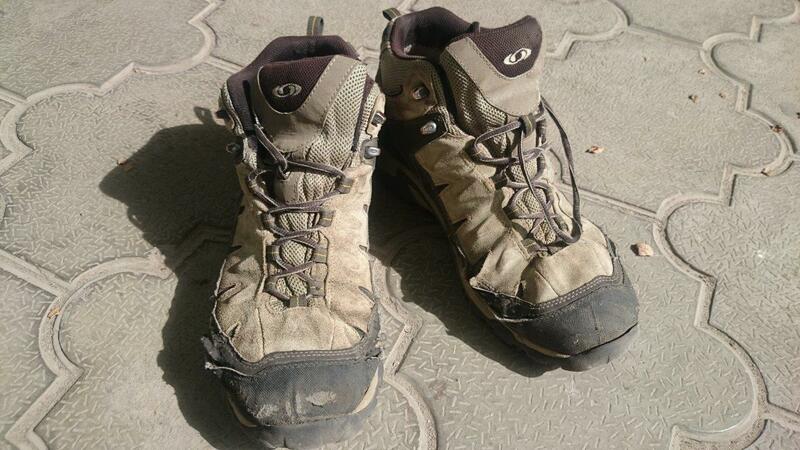 I’ve been using lighter Salomon boots as well, they don’t last as long but they are a little more versatile – I definitely don’t want to have to take a second pair of shoes while travelling. Clothes – Again it depends on where you are, but I always have a waterproof and windproof layer and some warm clothes for underneath. A wool underlayer works well, down for warmth to weight, and remember neck, hands, and head. Gloves are the most important while flying, but think multipurpose – I’ve got wool socks that can double as extra mittens under my wind proof overmits. Bivvy gear – I leave this in my harness. A bivouac sac, inflatable Exped mat, and sleeping liner for comfort. Sleeping inside that’s enough, outside you’ll need to use the paraglider (still in snag bag) and harness for extra insulation. If I’m going to higher elevations or colder climates I’ll need a real sleeping bag, in the past I’ve squeezed this into the sleeves of my jacket while flying, for extra warmth and to save having to stow it. A small lightweight tarp would be a sensible addition but in general I always look for shelter. In general you have to trade off a little discomfort during the night to be as light as possible during the day. SPOT messenger with ten minute tracking during flights and nightly OK messages – so I don’t worry about other people fretting or an expensive search and rescue. It’s also important to make arrangements in association with using the SPOT. Phone – the ultimate in multipurpose – but perhaps worth having a backup if possible, at least a backup USB power pack (maybe solar). I have a SIM card from every country I visit. I use XCSoar (free Android app) for track logs and inflight data, and Oruxmaps for navigating on the ground, in conjunction with more readable paper maps on a larger scale (1:100,000 or greater). I always study the maps well before I go, learning the lay of the land is part of the appeal. My Bluefly vario is light and extremely sensitive and accurate. It goes a long time between recharges so the main issue is developing a habit remember to recharge it, as I leave it on my harness. A great feature is the beeps on startup to let you know how much battery remains. A Gopro or similar along with my smart phone is great for capturing photos, despite making a commitment to concentrating more on flying I still love to document the whole adventure. The Baofeng UV-5R seems to be the best cheap radio around, and it does both the Australia and New Zealand frequencies (UHF CB) as well as European. They also make an airband radio. It depends on the trip length and how much time you will have to prepare food. For high energy, nuts (scroggin), peanut butter, chocolate, muesli are good to always keep hidden away in your harness. Pasta and rice make great daily meals if you have a cooker although if in Europe I go with bread, cheese, and dried meat. Check the energy content (kJ / 100 grams), go for high fat and high everything. Water is all the hype but personally I avoid carrying too much, I drink with meals and when water is available and rehydrate properly at least once a day. Don’t bring too much stuff – half the fun is being resourceful and it’s always good to have something to look forward to when you get back. Have enough gear with you to have no excuse not to fly far and land out – but only as much as you can carry back again. Interesting how you have paired everything down to a fine art of lightness, practically, etc, what is the make of your mobile phone now? Thanks for the tips Nick and I have been using Orux with maps for my motorbike rides since we discussed the best options. I have a Sony Action Cam as i prefer its profile over the GoPro and i’ll send you some footage of bush tracks when I get the chance to make a decent video. Keep well and safe travels bro!!! Great advice thanks will be trying a hike and fly soon do you have any tips on starter routes for two or three days?